SIWA families are invited to attend a playgroup with a Music & Movement Class. Namsan International Kindergarten (NIK) is offering this class complimentary for SIWA families. 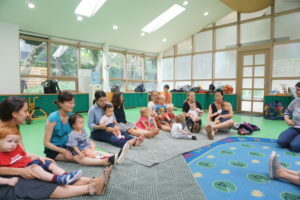 The 30-minutes session with both parents and children will be run by the school music teacher, while the playgroup is self-run by the parents. Ages birth to 5 years old are welcome. Parents must accompany their children. For the playgroup, the mom/dad come along with their child/children on a weekly basis to play with others. The parents are responsible for setting-up and cleaning-up of the play equipment or activities in the gym or playground (weather permitting). Picnic mats are available for crawlers and infants to use outside. The playground includes a mud kitchen, sand pit, swings, slides, bikes and more! Parents are encouraged to rotate as the playgroup leader. 9:30 – 10:30 AM Meet and greet with parents and children. Free playtime at outdoor shaded playground or the indoor gym. Light beverages (coffee or water) will be available. You may bring snacks for your child and, if you like, to share with others. Please note that the school is nut-free! Bring hat, sunblock, mosquito repellant and a change of clothes (optional). Limited parking is available on campus on a first come-first serve basis. Please write a comment in your event registration form if you would like to request a parking space. Families may sign up for one class or more! You must login as a member to view the SIWA Family Ticket (April 25th) option. 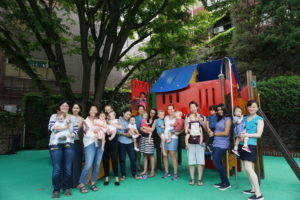 Moms and Tots (MT) provide an opportunity for “Mom members” to build friendships and meet playmates for your children. Locations and activities vary. Ages range from newborn to six years old.